6 Mess Free Easter Egg Ideas March 27, 2019 Bonding with your children is so very important, especially as they grow older! You'll always cherish the moments you spent doing special activities together, especially when you can look back and see how easy and mess free those moments were. The month of April is here, bringing warmer weather, longer days and Easter! One of the best Easter traditions is decorating eggs and displaying them for everyone to admire, the only problem is that it can be hard and turn into a giant mess. Leaving the kids to lose interest and Mama to be stuck with a huge disaster. To help ease up on some of the holiday stress, we're sharing six unexpected, fun and mess free ways to decorate eggs this year! - Tie dye is a hit with kids of all ages. This two-step tutorial including markers and baby wipes is simple and adorable, see the full instructions here at A Little Pinch of Perfect. - In a bind and need a quick resolution? Steal your child's pack of crayons and create these adorable colored on eggs! This is perfect for even the youngest of toddlers. Get the whole tutorial at Jenna Burger Design. - Get the look of a perfectionist in one easy step with these temporary tattoo cuties. Let your son or daughter pick out their favorite tattoos (butterflies, insects, pirates, oh my!) and then follow the steps over at Jane Can. -It doesn't get more personal than a fingerprint! 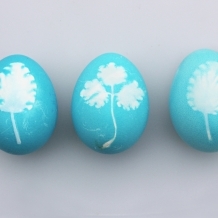 Make memories and adorable eggs with these fingerprinted eggs from Crafty Morning. - Does your little one love all things sparkles? These glitter dot eggs are a must! See the magic happen at A Pumpkin and a Princess. -Play ode to your little terror with these absolutely adorable Monster Eggs. You could skip the dye all together and just use the googley eyes and sharpies for a completely clean process. Fall in love with this easy DIY over at Artzy Creations. No matter how your eggs turn out, you will have a lifetime of memories. And hey, even if you mess up, those stories are more fun to laugh at later!